What a nasty way to start the new year! I’m so very late again. I have so much to tell you about our Christmas holiday in the Philippines. It has been 19 years for me since my last Filipino Christmas so I was excited and had high hopes about it. 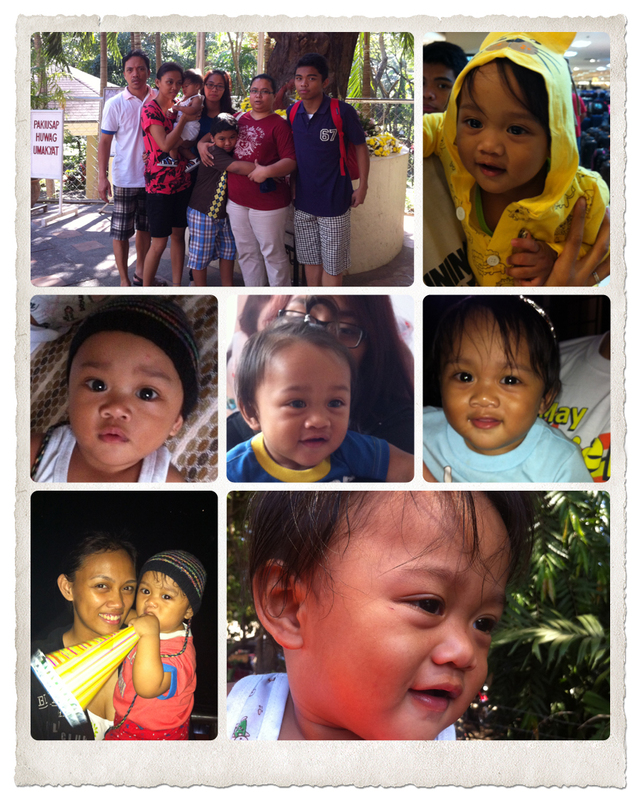 But before that, let me show you the person I miss the most from the Philippines: my grandson Nash! 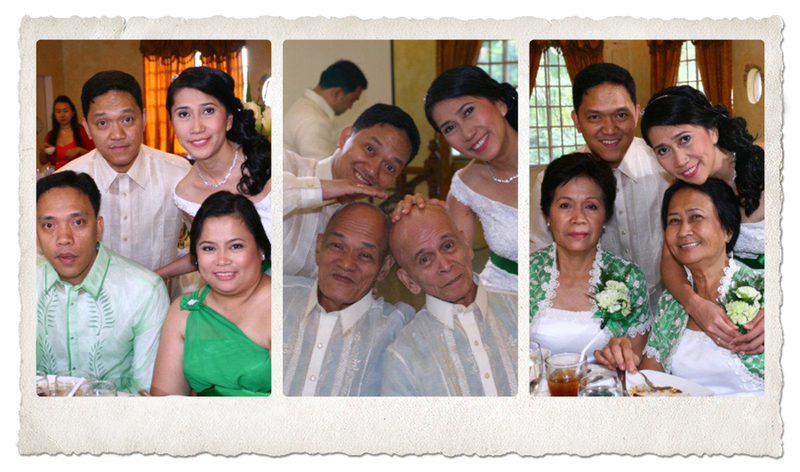 The main reasons why we went home for the holidays was sister and brother-in-law’s wedding. Or Ratification of Holy Matrimony as the priest likes to call it. Not wedding vow renewal because wedding vows do not have an expiration date. Good to know! So the planning stage started around early summer 2011 and, although I said I would help her, my sister took care of mostly everything. Being the perfectionist that she is, it was probably best that she chose the colour motif, the design for her wedding dress, etc. I had input, mostly to change the dress choices for the bridal entourage which didn’t please her much because some of the girls kept arguing about it. In the end it was all resolved and everything was perfect. The wedding took place nearly at the end of our holiday and it meant seeing friends and f amily only that day. There were a lot of people I didn’t get to speak to or say hi to, but I’m sure they understand it was because we were all busy. With Christmas and Ronan’s birthday celebrations over and done with, and with about 6 hours of sleep, we were out the door at 2.30am to get to the venue (Blue Gardens) for hair and make-up. Just us girls. The boys didn’t need much or any make-up so they were lucky to get a couple more hours of sleep. After about 6 hours getting ready we all filed out into the garden to wait for the procession to start. We caught up with friends and family as much as we could. Okay, enough with the talking, let’s look at photos now. By the way, none of these photos are mine. They are from the official wedding album. My dear Canon packed up on me after a mishap with a USB cord and a Sony Bravia TV, but it’s in the hospital now and hopefully, $200 later, will come out of this month-long coma soon. The ceremony was held at 9am-ish so we had plenty of natural light which was softened by the tent overhead. Apparently ceremonies at dusk are even better because they have all these fairy lights everywhere and the ambience just changes dramatically! Anyway, here is a photo of the ceremony venue with pre-wedding portraits of my sister, her husband and their children (ring bearer and flower girl!). The bridal entourage, aka nieces/daughter/sister/sister-in-law/friends. Behind us are friends and teachers from high school (mostly) and some family from the husband’s side. 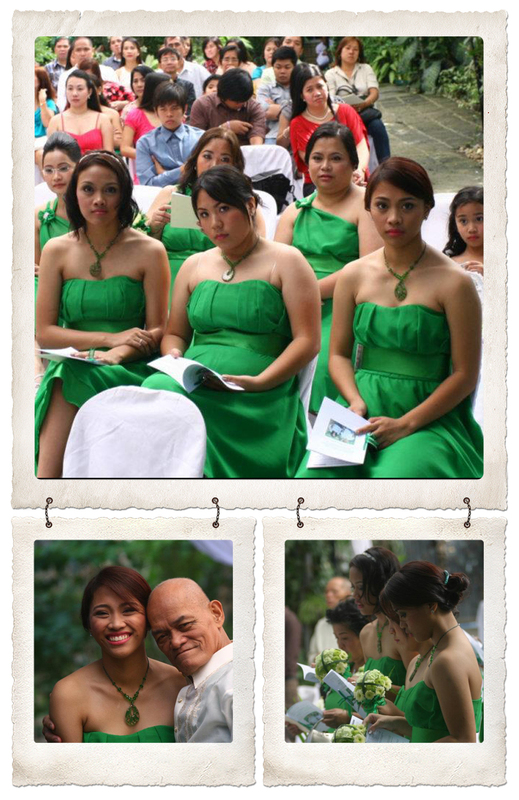 The bottom right photo is my daughter Eibee and our father-in-law. In case you don’t already know my sister’s husband and my husband are brothers so we share the same in-laws. The groom and his men. Not in tights though. Friends since high school who have stayed loyal and true. I think they had a little too much fun with the jump shots. The bride’s dramatic entrance was, well, dramatic. I’ve seen it in movies where the crowd just goes into this stunned silence as the bride starts walking down the aisle, but this is the first time that I experienced it. There was a collective murmur of “wow!” as the doors opened and my sister started walking precociously down the rather uneven and slippery steps. For most of the guests, it was the first time they had seen her. Our baby brother was on the side ready to jump to her rescue in case she slipped, but he was not allowed to help her walk down. There was an arch at the beginning of the walk down the aisle where they had bubbles blowing and they released these beautiful butterflies. That was where my sister stopped smiling and fought very hard not to let the tears come out as she saw her husband at the altar, wiping tears from his eyes. Everyone in the house shed a tear at least. It was very beautiful. My photos are not in order, so just bear with me. Here are the groomsmen and bridesmaids, all cousins. Half of them are my children. 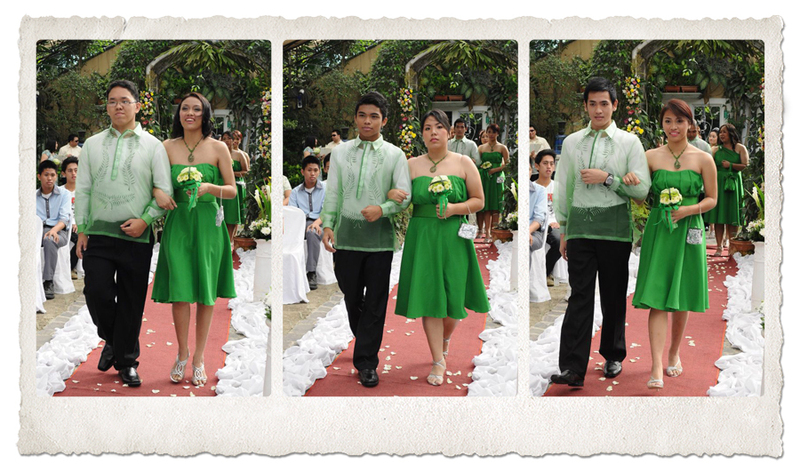 From left to right, Nikki and Viel, Joseph and Kaye, Glen and Eibee. 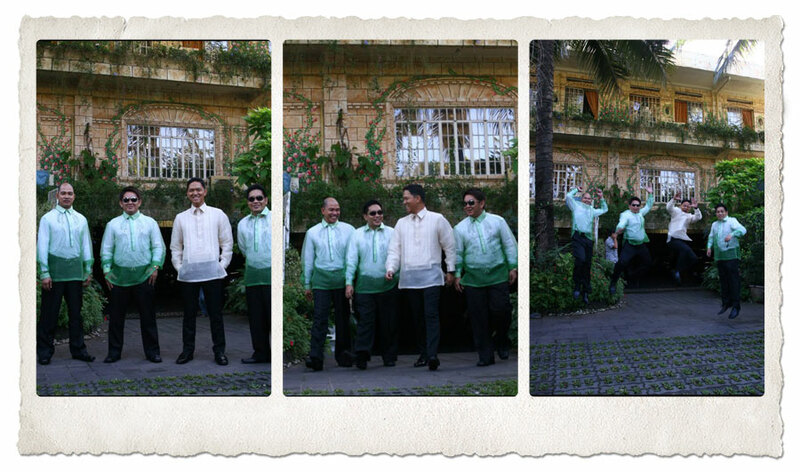 All looking very good in their respective barong Tagalogs and dresses. Here’s a hodge podge of photos, left to right top to bottom: the groom and his entourage including his father and uncle, my parents, Ronan the ring bearer, Patrick the coinbearer, Isabelle the flower girl, the only four girls in the family and my sister approaching the halfway point of the aisle. Almost everything in the wedding ceremony was handmade, or put together by us. 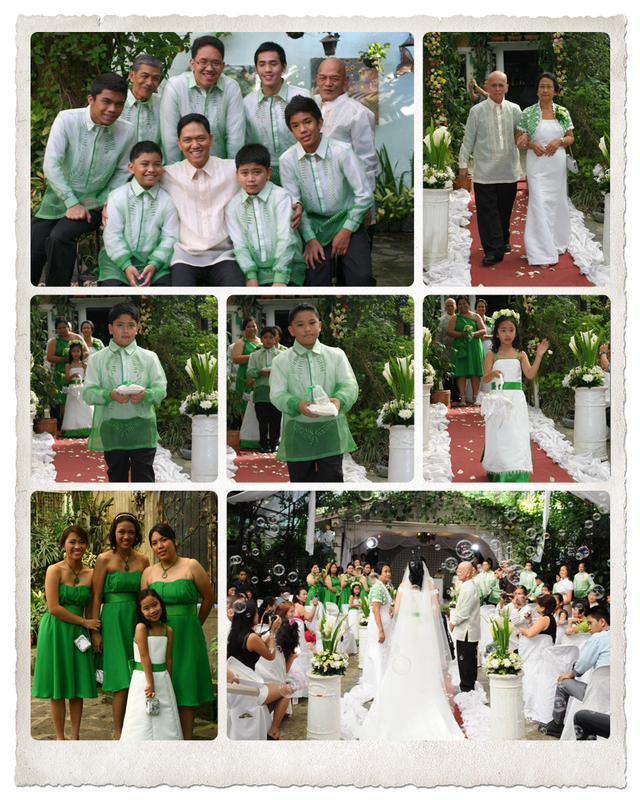 The dresses from the bride’s to the flower girl’s were made by my Mom and our family friend, Ate Lita. They were also the ones who made my wedding dress. They are both trained and practicing dressmakers so we were all in good hand. The ring and coin pillows were knitted by yours truly, so I think I earn bragging right there. We added the ribbons to tie the rings and the little case for the coin a few days before the wedding. We put the ribbons and flowers even on the candles and we wrapped up little giveaways for every guest. It was quite fun, stressful but fun. There was plenty of time for group photos after the wedding. They were very organized and called out each group separately so everyone had a chance to pose with the couple. Top to bottom: the secondary sponsors (Cielo, Cathy, Beth, Vic, Joel and Owel), the bridesmaids and groomsmen (you know who they are!) and the kids (Cedrik, Bellybutton, Ronan and Patrick). And Filipinos love wacky poses. We just do. We even spent time practicing in front of the mirror so that we don’t look awkward with mouths hanging open or eyes closed. Eibee’s wacky pose is a winner though! The ceremony was very beautiful. The priest had some very wise and interesting things to say about the ratification of the holy matrimony. The couple had written their own vows and it was indeed the highlight of the ceremony. My brother-in-law could not even begin to speak as he was choking up with tears. I had a photo of my sister wiping tears from his cheeks, but I think it’s still in my sister’s camera. The bride’s and groom’s respective families take their place for the photos. The kids prepared a surprise dance number for the reception and had only a few days to practice. They did the choreography themselves and did a mix CD as well. I will post the video from my iPhone as soon as I get it converted. It was quite cute too! Some photos from the reception for you. Oh look, there’s me! Middle photo shows the couple with their fathers. Both bald, yes. And the moms of course, both looking awesome. It was a long, wonderful, exhausting day. I know that most of our friends and family will be talking about this day for a long time to come. 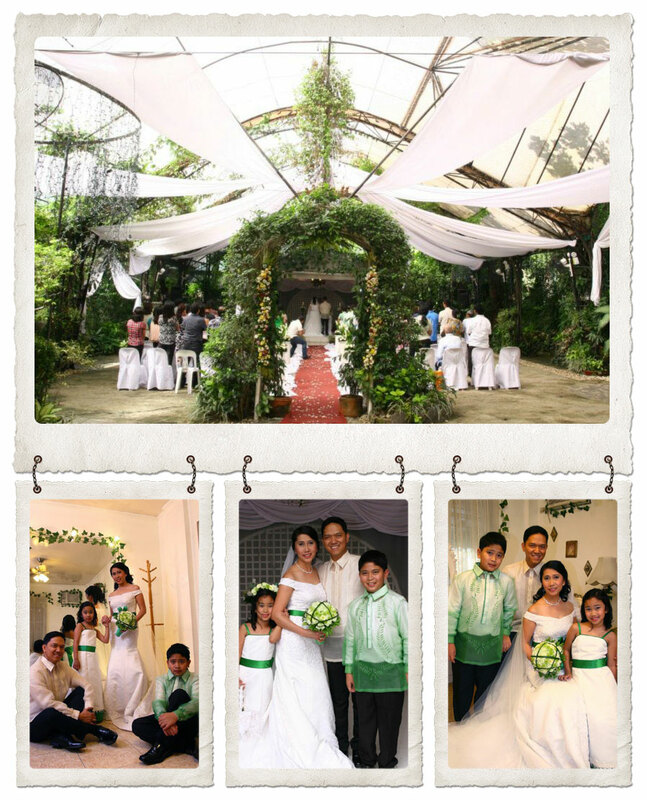 Congratulations again, Obet and Inda. I’m proud to be your sister. What a gorgeous ceremony and such a handsome couple. 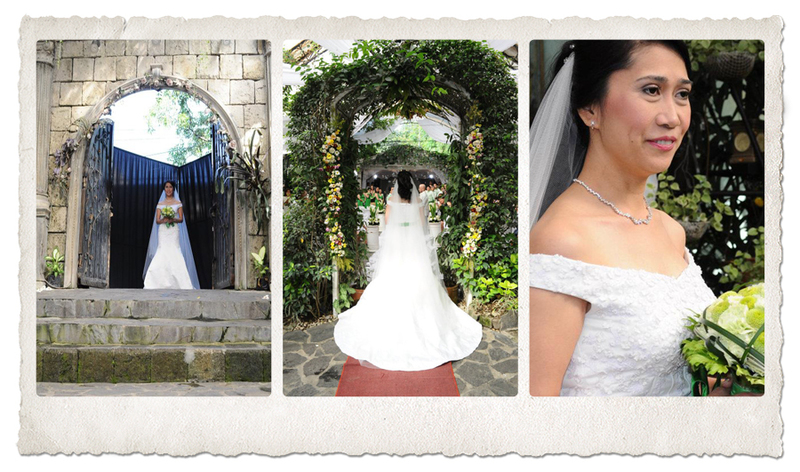 I’m blown away that your mom made the beautiful dresses including the bride’s stunning gown. WOW! You look fabulous, love your hair and your dress is da bomb! Wedding vows never expire, awww!!! Wow, J!! That’s one incredible wedding : ) You looked absolutely stunning, sistah! And isn’t your little Nash (I love that name) a cutie?